சிவகங்கை மாவட்டத்தில் உள்ள திருக்கோளக்குடி கிராமத்தில் பன்னிரெண்டாம் நூற்றாண்டில் நடைபெறும் கதை. வரலாற்று நிகழ்வுகள், பேய் பிசாசுகள், கோவில் நகை திருட்டு எனப் பயணிக்கிற கதை. மிக மெதுவாக நகர்கிறது. very slow narration, below mediocre whodunnit, immensely tested patience to complete it. when the narration is so contemporary, pray why historical tag ?? A historical thriller with a touch of the paranormal, in the same captivating Gokul Seshadri style. கோகுல் சேஷாத்ரி - Gokul Seshadri is the author of five books (three novels and two short story collections) in Tamil. All are works of historic fiction - based on the ancient and medival history of South India. The author is also a historic researcher doing PhD in History - specializing in Ramayana sculptures. This background helps him to distinguish his creative works from the rest. All of his stories are studded with minute geographic, cultural and historical references - be it inscriptions, copper plates, archaeological remains or otherwise. This unique blend of historic material and fictional characters / events have become characteristic hallmarks of his writing style.Gokul's initial interest in history grew out of his passion for Kalki R Krishnamoorthy's magnum opus titled "The Son of Ponni". He joined like minded friends and found Varalaaru - a monthly web magazine for South Indian History. Rajakesari, his first historic fiction was published by Palaniappa Brothers in 2008. It is a historic thriller set in the beginning of 11th Century during emperor Raja Raja Chola-I's times.Paisaasam,(meaning The Ghost) also a historic thriller - is based on a rare inscription in South India that talks about a Ghost. 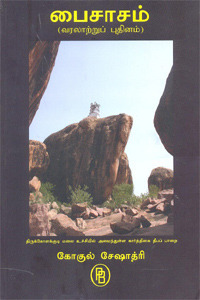 Cherar Kottai (The Fort of Cheras), his magnum opus running more than 1100 pages was published in 2012. It is woven around the famous martial art school in ancient Keraa called Kanthalur Sala and involves Kalarippayattu - a martial art form being practiced in Kerala even today. This novel has won critical acclaim from many readers.Madhurakavi is an award winning short story collection published in 2010.Thirumaaligai, his latest book published in 2017 is also a collection of stories - the main one detailing the last days of emperor Raja Raja Chola I at Udaiyaloor near Kumbakonam, Tamil Nadu.